Art and work represent two hemispheres of the brain and two endeavors that may appear to be mutually exclusive. 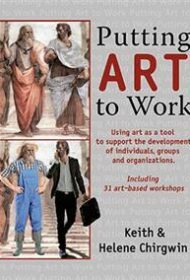 In this pioneering workbook, authors Keith and Helene Chirgwin present their efforts to bring visual arts workshops into the workplace and offer a structured approach to enhancing creativity in groups of all kinds though engaging in hands-on arts workshops. The Chirgwins cite numerous studies to demonstrate the benefits of art-based workshops in corporations or other professional environments. They argue that the arts facilitate change management, foster personal and professional development, and encourage innovation and creative problem solving. Art also requires a range of skills and modes, including planning, imagination, communication, collaboration, analysis, all of which are instrumental for teams and individuals tasked with creating results. The workbook’s first portion presents the theory behind bringing art-based workshops to businesses and other organizations. The authors ground their work in the literature around organizational behavior, human resource management, and other disciplines. They discuss the elements of art that render it a catalyst for organizational and personal development and explain the role of the leaders or coaches, describing how to develop a structured dialogue within the workshops. The book’s second part provides details of the arts workshops. For each of the more than 30 workshops described, the authors articulate the objectives and methods, time and materials required, and list of steps for leading participants into a creative journey. The Chirgwins’ admirable mission is to enhance wellbeing in our often drab and mundane workplaces. Their multi-disciplinary perspective demonstrates an impressive intellectual rigor and speaks eloquently to how what we see and how we see shapes our cognition both as individuals and in organizations. Their insightful use of graphics, which appear on almost every page, help underscore the points. In sum, this well-organized, detailed guidebook provides a valuable tool for any group that has the potential to unlock its latent creative powers through encounters with the visual arts.